Your first preparation phase to step onstage can be one of the highlights of your athletic life or a nightmare you regret for years. Learn the ropes from a high-level competitor who's been there! You don't need to step onstage in order to have a great physique. And honestly, even when done right, contest prep is a gruelling undertaking that's definitely not for everyone. That said, if you've been harbouring the dream of competing, now's the time to do it. For one, there are more categories to fit your body type and goals than ever. But on the other hand, winning isn't really the goal the first time around. Plus, there's nothing like having a date on the calendar to spur you into discovering the best shape of your life. I know it did for me. I've been a natural physique competitor for more than five years, competing in 10 shows and winning two U.K. titles. I've also coached other physique, fitness, and bikini competitors along the way. I've seen both the right way and the wrong way firsthand—especially in regard to that crucial first show. If I could go back in time, I'd stop myself from making these five errors. But since I can't, I'll try to point you in the right direction instead! During my first week, I cut around 1,000 calories from my diet—and I paid a serious price. Sure, I dropped a significant amount of weight, but my body quickly let me know it was too much, too soon. There are several risks with dramatically cutting your calories early in your prep. For starters, the weight you lose will be a combination of glycogen (stored carbs), water, excess body fat, and definitely some muscle tissue—a competitive physique athlete's worst nightmare! The drop in calories will cause your energy levels to plunge, affecting your ability to train hard. I experienced some dismal days and really poor workouts as a result of my aggressive calorie cut. When your weight loss plateaus, there will be nowhere to go in terms of cutting more calories—you simply can't be any more aggressive! You then have very few options on the table to continue making progress without doing serious damage to your metabolism. My advice is to start your prep with a small caloric deficit. In fact, even 2-3 weeks before you start your prep, I recommend that you find your maintenance level of calories by eliminating all junk foods and determine your macros that allow you to maintain a stable body weight. Then, drop just 300-500 calories in your first week, which will be enough to create an effective caloric deficit. Your aim is to lose 0.5-2.0 pounds of body fat per week, a safe and sustainable amount. Cut calories from your carb intake and a small amount from your dietary fat, keeping your protein intake stable throughout prep. That's it. Don't do anything more dramatic for the time being, including carb-cycling, until you are deep into your prep. A very common mistake beginners make is winging it and trusting that a modified version of their usual approach is "good enough." This may work in those early days, but when progress plateaus, you need to have a system to fall back on. Like many beginners, I found myself so focused on what I saw in the mirror that I paid very little attention to the scales and other progress indicators. After several weeks prepping, the mirror started to look the same, and I no longer had any idea if I was progressing. If I had been more diligent in my approach, this wouldn't have happened. Make a habit of recording your core measurements. These include not only body weight, but also body circumference measurements such as your chest, shoulders, arms, waist, and upper legs. Record these stats at the start of your prep and every four weeks, weigh yourself daily, take progress pictures weekly, and log your training sessions to the rep. Use BodySpace and keep track of everything in one place. These progress indicators will be your best friends when self-doubt kicks in or when your progress plateaus. There's an old idea that very high-rep training will help you drop body fat faster and bring out muscle striations. While high-rep training does have a place within a training program, it comes at a big cost during the pre-contest cycle: loss of strength, loss of muscle fullness, and reduced muscle mass. And that leads to a big disappointment. Strength drops are inevitable during prep, not least of all because your caloric deficit will affect your energy and hormone production. But in my experience, switching to super-high reps will only accelerate the rate at which you you lose strength and size. You still want the heavier weight stimulus to maintain your strength and keep your muscles looking fuller. The answer is to train the same way you trained to build your muscle in the first place! Using weights that are heavy enough will help you maintain your strength and keep your muscles looking fuller. Only use high-rep, low-weight training to deload from heavy lifting. And if you don't have a deload somewhere in your program, well, your program needs help. 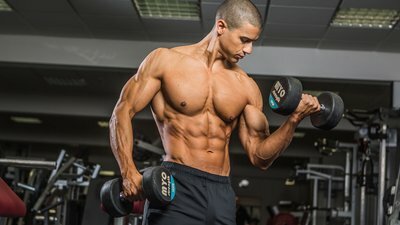 To burn more calories during your training session, use selective amounts of intensity techniques in addition to your heavy weights. One of my favorites during competition prep is supersets, which I'll throw in toward the end of a workout to really fatigue a muscle and burn more calories. I became a social recluse during my very first competition prep, and I still regret it to this day. Make no mistake: Competition preparation will challenge your social life. It will result in far fewer social meals, drinks, and get-togethers than you allowed yourself during the offseason. It can also affect your relationships. Your partner or family members may not appreciate you eating alone, eating different foods, or taking Tupperware to family outings. But here's the thing: Having a supportive cast is essential to have a positive experience with your prep. What's more, I would argue that you must invite others into your world. It won't be easy. Competition prep can be a very self-centered time, and it's up to you to find that balance while not isolating yourself from your friends and family. But if you want to go on competing as a hobby—or even as a professional—for years to come, you don't have a choice. I've been very fortunate to have very supportive friends and family, but many competitors I've spoken with have suffered in the past as a result of letting their competition prep get the better of their lives. Don't let this happen to you. Just like with nutrition, beginners who are unsure how to begin a competition prep tend to go all-out from the start. Their workouts immediately get significantly longer than they were before, with high-volume lifting sessions, endless amounts of cardio, and few or no rest days. Meanwhile, because they're in a caloric deficit, their bodies are far more vulnerable to burning off significant amounts of muscle tissue for energy. This approach doesn't pay off. Training for long periods at high intensities usually leads to early burnout and causes you to look flat or stringy onstage. If your cardio training is too exhaustive combined with lengthy gym sessions, you'll gas out. Here's a better approach: Limit your weight-training sessions to no longer than an hour, not including warm-up and cardio. Be efficient in the gym, focusing on multijoint exercises, and avoid training to failure on every exercise. Your recovery will slow down as a result of dropping body fat and reducing your calories, so take this into account and make sure you have enough rest programmed in. In regard to cardio, be conservative, and use it as a tool to help create a larger caloric deficit. In the early days of prep, try to limit the number of cardio sessions, relying primarily on your diet to produce the desired effect. When your progress plateaus, add just 1-2 weekly cardio sessions before assessing again. Address these five common beginner mistakes, and you'll be off to a great start. Prep still requires hard work, consistency, and dedication, but the process will be a lot smoother, and you'll preserve more muscle, burn more body fat, and make competing more enjoyable. You may even discover why so many athletes come back for a second shot.